This little musical artifact won't fetch much on Ebay even after MJ's sudden death, but I'm still glad my wife held on to her cassette copy of USA for Africa's "We Are the World". Unfold the insert and you're tempted with several opportunities to feed the hungry in Africa while sporting the current 80's fashions. Now, don't try to read the small print above, because I found a fun way to find out who all participated in this historic event... I'll show you at the end of this post. For now, below is the article I teased some time ago from the March 14, 1983 edition of Rolling Stone. 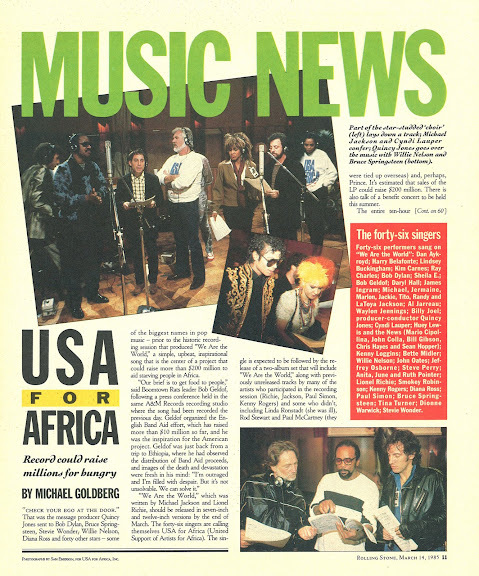 This is a brief yet insightful write up about how "We Are the World" came to be. Click either image to enlarge & read. Interesting, huh? Prince - hmphh! Who needs him anyway?! So, back to the album art. Take a look at the group shot below and try to identify some of the artists at this interactive guessing game. Now, sit back, pretend like you've just tuned in to Friday Night Videos and enjoy the song. 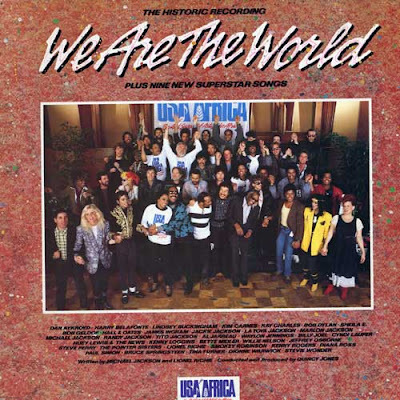 Wikipedia entry for "We Are the World"
Scripted lyrics for "We Are the World"